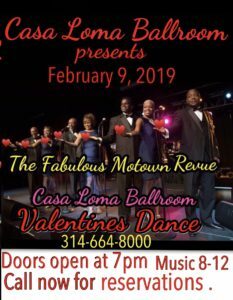 Dance to the iconic Motown songs of the 60's and 70's with THE FABULOUS MOTOWN REVUE featuring VELVET and DIAMOND DIVAS. Doors open 7:00pm. Dancing 8:00-12:00am. Admission $15 / $17 Reserved seating available with pre-paid reservation. Call 314-664-8000 Special, PROGRESS BAND from the 60's will open up at 8:00pm. A reunion of some great music!